Love this comforter! It has the same feel as down, but not as heavy. It washes and dries very nicely and is very soft and comfortable. It comes in a variety of colors that are reversible. I would purchase this comforter in every color! Comforter is very soft and warm. Sheets very comfortable and fits my mattress which has a foam mattress on top. Sheets stay in place and don't come off mattress corners. The feel of the sheets, pillow cases and comforter are excellent. They are soft and not scratchy at all. They keep you comfortable and not hot at night. I highly recommend this set and thinking of getting another in different color. This set is so nice. The sheets and the comforter are so soft. Very good quality for the price. I will purchase these again. 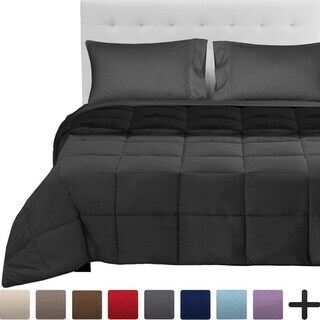 It's gorgeous, comfy, and love being able to chose between black & red for my comforter. Sheets are soft and for me, the comforter was just the right weight, not too heavy and not too light, just right. Just call me Goldielocks, haha. I love the way it looks on my new bed. I would buy again, I might actually in a different color down the road. Recommended, especially for the price. I love how soft the sheets are. The comforter is really thick and has some weight to it. Also, I like that the set has a lot of different colors and you get to select the color of the sheets that you want. With normal sets, you don't get a choice. The sheets are very soft and the fact that is is reversible is awesome. This is perfect for a teenage boys room. Great value for the price. Highly recommend! This bedding set was a steal! Very comfortable and washed well. The sheets do not cause me to feel overheated at night and the comforter keeps me warm and cozy so far this Midwestern winter. I would highly recommend it.